Early morning shifts, late night shifts, either way, we all need to get up in order to complete the daily routines in our life. Lateness can often result in a whole chain of negative events that no one wants to suffer through, and so it is always best to do everything you can to get up on time for work (or a trip away). There is one thing that we all need in our lives. That thing is an alarm clock, and a radio alarm provides you with the ability to get up on time as well as tune into your favourite stations while you prepare for the day ahead. There are so many out there, each offering different benefits and stations for you to enjoy. With one of these next to your bed, we can assure you that waking up on time will never be an issue again – especially when you see just how loud some of the models we have selected can get. We know it’s not easy to pick an alarm, or know what’s right for you, but we are here to give you a hand with things. 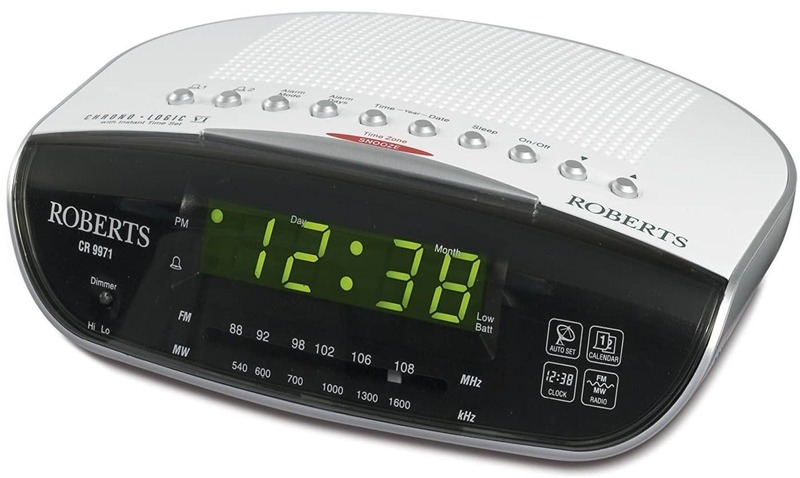 In order to help you find the best radio alarm clock, we have put this guide together, compiling all of the relevant radio alarm clock reviews in one place, so you can find one that will help get you up. There are a few benefits to having a radio alarm clock around, and we know that you won’t be disappointed when you have one sitting on your bedside table. Now that you know a little more about the benefits of having one around, check out the internet radio alarm clock reviews below and see what you think. Sony is one of the biggest names out there, and they are known for their great audio devices and home electronics, meaning that you are in safe hands when it comes to this DAB radio alarm. If you think that this could be the perfect one for you, why not check out the reviews below and see what you think? 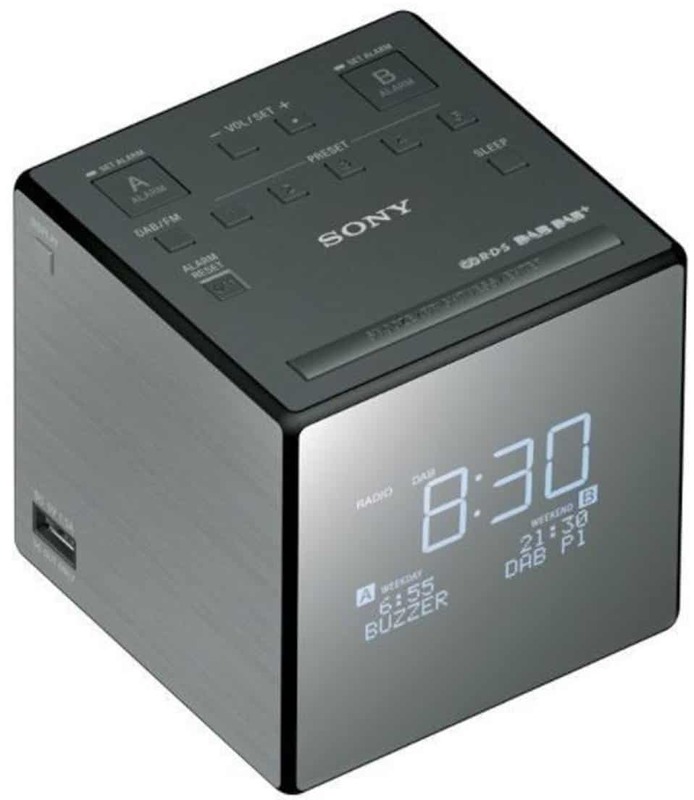 This radio alarm clock comes in a really cool cube shape, so it sits perfectly on your bedside table with a truly modern design. It comes in black and grey to blend in nicely with your home, and the LCD screen on the front is nice and large, displaying things like the time, date, radio station, and the alarms you have set very clearly. All of the controls are on the top, making them easy to access and read. It features a very lightweight and portable design so that it can be moved around easily for your convenience. Additionally, it has DAB, DAB+, and FM radio stations so that you can tune in to the shows that you love most with great ease, and there are even a number of presets for your favourites. The USB port on the side can also be used for charging your phone while you sleep. The controls can be a little fiddly to use and get used to, especially the volume control (located on the back). 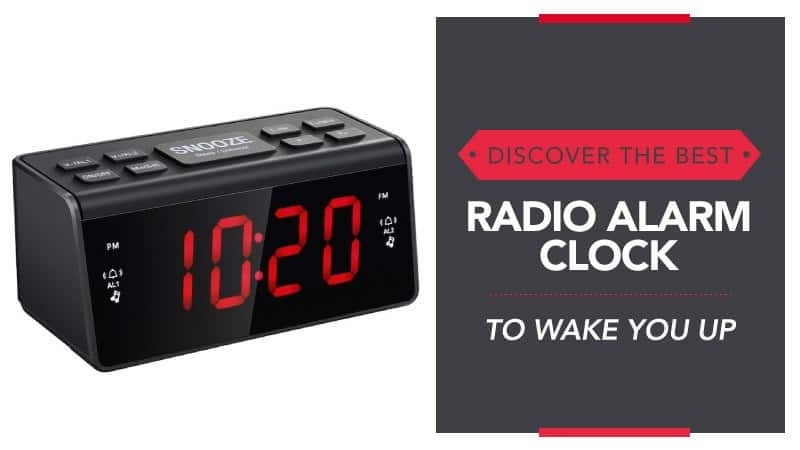 This radio alarm clock comes at a great price that can fit into a good number of budgets quite comfortably, and the unique design saves space on your bedside table so that you have more room for things like your books and phone. While the controls can be a little fiddly to get used to, they are a learning curve that comes with great results when you get the hang of things. With a good number of presets, additional features, and a clear display, we are sure that you will love this model. Roberts is another superb brand, and one that many know and trust because of their great home electronics and devices. For a digital radio alarm clock that does nothing but aim to please, you might want to keep an eye on this model. Go ahead and read the reviews below to see if this is the one. This radio alarm clock has a really cool and futuristic design, with silver and black colouring to keep it looking classic and ensure that it fits in nicely with the rest of your home. The display is very clear, ensuring that you are always able to see the time, and the controls are on the top and front of the clock for easier access. There is even a snooze button for when you want an extra five minutes. It features both digital and FM radio so that you can tune into your favourite stations while you get ready for the day, as well as an automatic dimmer so that the screen light doesn’t keep you awake, and a sleep timer so that you can drift off to your top station. There is a dual alarm so that you can have one for off days and work days, and it will automatically change the time along with daylight saving. Some customers found the controls were a little difficult to operate and get used to at first. This radio alarm clock comes at a budget price, making it a cheap yet quality option for those who don’t want to spend a lot on a new alarm clock. While some have found the controls a little difficult to get used to, this is normal and once you have spent a few days waking up to it, things will be a lot smoother. There are loads of great features and the overall design is very smooth, as well as perfect for blending in with your home. It has everything you need to get up in the morning feeling good. Most radio alarm clocks will sit comfortably on your bedside table, and this could be the perfect model to save you space and get you up. Read the reviews below and see what you think. 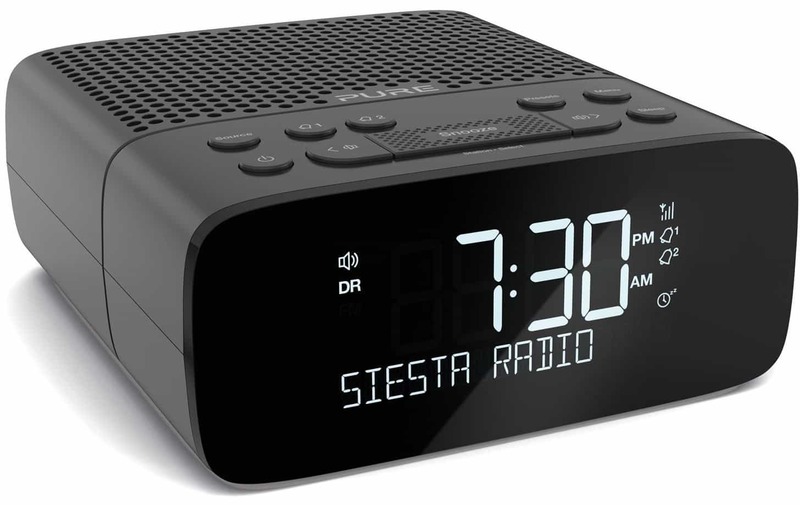 This radio alarm clock comes in black and has a very modern design, although there is a selection of other colours that you can choose from if you prefer something a little brighter. The display is incredibly large and clear, ensuring that everything from the time to the current radio station is perfectly readable at all hours of the day. There are also ten presets included for your convenience. It has DAB, DAB+, and FM wavelengths, ensuring that you have full access to the channels that you love the most. The time changes automatically according to the seasons, and there are two alarms for you to set so that you always get up when you need to. The sound from the alarm is great, and you will find that the time and alarm adjustments are really easy to set. The instructions are not the easiest to read, but they can be downloaded online for better clarity. This radio alarm clock comes at a really good price, and one that can slide nicely into most budgets with comfort. It has a lot of great features, and while the instructions are not always the clearest, there is a set that you can download online that makes a lot more sense. There are a number of presets to make listening to your stations easier, and it has access to all the wavelengths you need to never miss another show in the morning – not to mention the great dual alarm. Here are some further models of radio alarm clock, just in case the ones above do not quite meet your requirements. If you are a heavy sleeper, you won’t miss out on another morning alarm with this ballistic bellowing through your home. 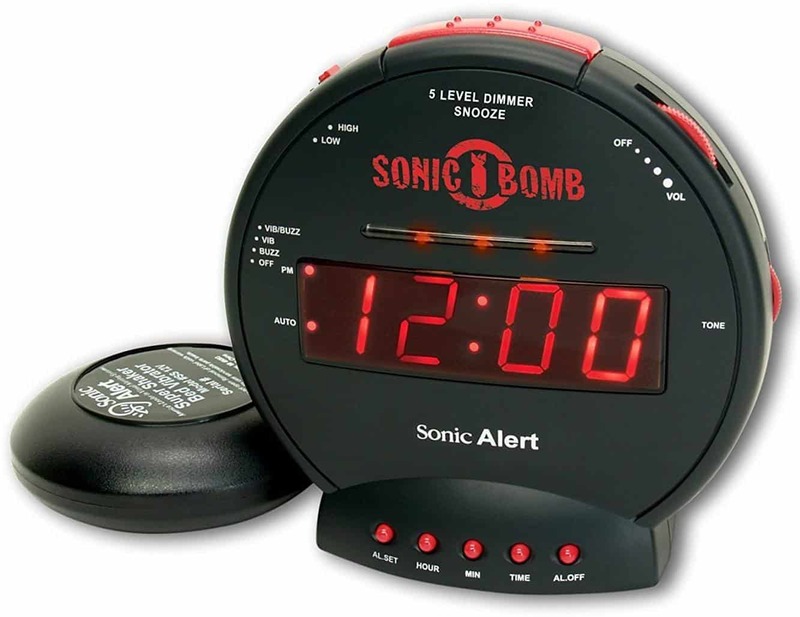 With 85db of sound, it blasts through the home like a sonic bomb and is sure to leave you up and ready within seconds. It has two alarms that can be programmed, with the alarm itself lasting between one and 59 minutes – depending on your preferences – and the display is excellently clear for easy reading. You can even control the volume level and the overall tone to make it fully customisable. With a sleek and almost military design coupled with an incredible price, you are sure to find yourself on time once you have this in your home. As an additional note, there is a shaker pad that can be placed in the bed so that the whole thing shakes when the alarm goes off. 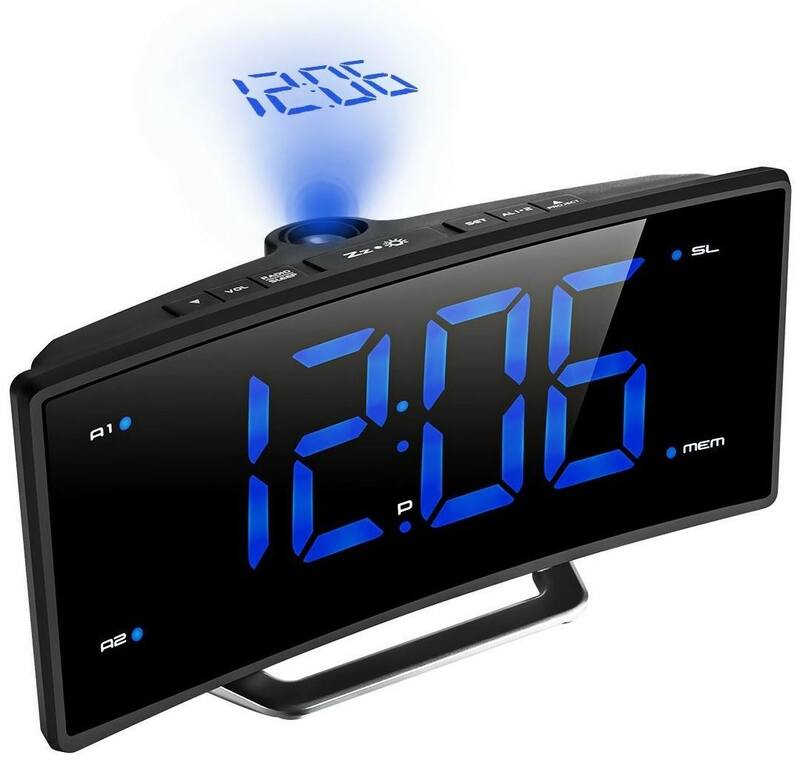 This is the perfect model for those who not only want something very affordable, but also a radio alarm clock that can project the time onto the wall or ceiling so that you are always in the know. It has 10 presets and FM radio, so that you have a good selection of stations to tune into when you are falling asleep or getting up in the morning. There is even a sleep timer for the radio, as well as dual alarms for you to set and a selection of tones. The USB port can be used to charge your mobile phone while you sleep for added convenience, and the display is easy to read even from a distance, all thanks to the large and clear lettering. With such a stylish design and great functionality, it really is a steal. Hopefully, this guide has helped you to find the best radio alarm clock, and that it has given you a little assistance when it comes to figuring out which of these is going to help you battle the early mornings (or late nights) before work. We have ensured that the clocks we have gathered here come from trusted brands so that you are getting the best possible value for money when you select one to become a part of your routine. Of course, with so many brands and each clock having a different advantage or main feature, it is impossible to choose just one to feature as the best, but we will say you can never go wrong with Sony. As we know that many people don’t have a massive budget, we have made sure to include a range of prices (as well as volumes) so that everyone can have something amazing. What did you think of our radio alarm clock guide? Are there any that you would have liked to see or recommended? We love hearing from you, so make sure to leave us a message in the comments below.